Midwest Motors is your choice for used cars, trucks, and SUV's – but did you know we also sell and install flatbeds? We have a wide selection of aftermarket truck beds, flat beds, service body, utility body, and replacement truck beds for sale. Our crew has years of experience installing flatbeds and flat bed accessories. Our service body and utility body installs are top notch – we use high quality parts because we know your truck needs to be able to stand up to the work load. The thing that sets us apart from the others is that we keep CM Truck Beds and Flatbeds in stock at all times – so you don't have to wait weeks for a bed to be ordered, delivered, and installed. We can get your truck set up with a new bed faster than anyone else in the region. Call Us At (636) 938-5777 Today! Why Choose Midwest Motors for Your Flat Bed? Midwest Motors has been helping customers find the perfect flat bed for the job since 1995 – and it shows. Our customers return to us time after time because they know we are the best with installing flat beds, truck beds, utility body, service body, and other modifications to trucks in the Midwest. Want a lift kit put on? Need bigger wheels? Step bars, light bars, cattle guards? We can do it all! Give us a call at (636) 938-5777 so we can help you with all of your truck upfitting needs! We have been helping St. Charles customize trucks for over 20 years! CM Truck Beds is proud to introduce the new DB Truck Bed Model. Providing a durable, state-of-the-art dump hauling body at a great price point, CM’s DB is a robust work truck body that comes standard with superior features and unparalleled options. CM Truck Beds’ DB is a dump truck bed designed to handle the heaviest loads no matter the circumstances. This new steel truck bed model features 10 gauge floors, side steel hinges, heavy duty rear uprights, and a 2 point EZ open rear combo gate. Additionally, this truck bed also comes standard with wood pockets, ¾” bullet lights, pistol grip rear gate handles, and more standard features. CM’s DB also provides customers with an optional 48” or 60” tapered cab protector, folded down sides with recessed pistol grip handles, ICC bumper, and an integrated hoist with a scissor lift. When it comes to CM Truck Beds’ DB model, this truck bed is built to work, and built to last. 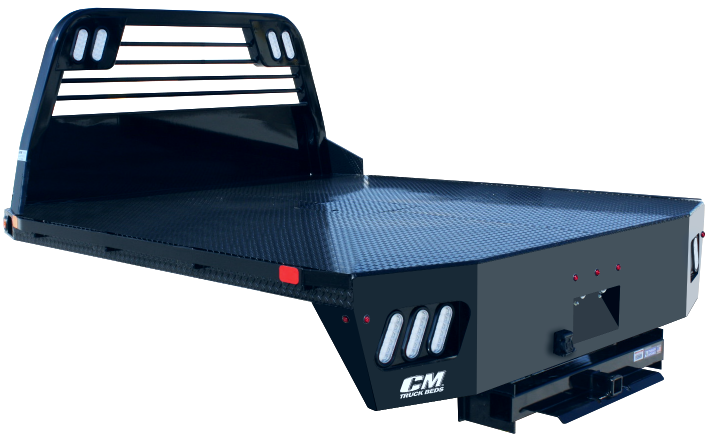 Want to know more about CM Truck Beds? CM Truck Beds is the household name for truck bodies and has been building household factory beds for more than 20 years. Their dedication and loyalty to producing only the best body haulers has made them the most highly recommended truck bed manufacturer in the country. Standing by their reputation, but always looking to the future, CM Truck Beds is proud to stand behind their battle tested haulers. CM Bed Toolbox Management Options! We have two great options for storage on our popular TM Toolboxes. These options provide a great addition to your inventory when searching for the best storage solutions for your new customers. First, an alkaline cleaner is used to remove and shop dust, cutting oils, dirt, etc. Then, a rinse is used to remove the alkaline cleaner. Third, an iron phosphate conversion coating is used to enhance the adhesion and corrosion protection of the powder coating, which is followed by a final rinse of deionized water to remove the excess iron phosphate. Call Midwest Motors in Eureka Missouri for all of your CM Bed needs. We have a large inventory of CM Flatbeds in stock, we are a full service dealer, sales, installation, and repair. Innovative by nature, industry leading by design. Hundreds of thousands of people have trusted B and W Trailer Hitches with their hitches for many years. Built right here in the USA, B and W prides itself on building the best hitches in the business. That’s a big reason they decided to exclusively supply CM Truck Beds with their hitches, on the bumper and in the bed. Our 14,500 lb. rating is standard on the bumper and our 26,000 lb. gooseneck hitch is what sets our towing apart, allowing our users to live the life of hard work and heavy loads. No doubt, our beds have the finest hitch system in the business-you can bet your hitch on it. CM Truck Beds is supplying customers with the best quality when it comes to lighting. By equipping all of our beds with LED lighting our truck beds will help you haul with ease, when work carries on into the night. Carrying a full line of all steel and aluminum truck bed models’ our LED lights will outlast others using standard lighting. CM Truck Beds has always offered value to its customers. With the new way of lights for our truck beds, our products will not only have lights that are energy efficient and last longer, but also will outstand the toughest hauling jobs. LED lights are the latest and most exciting technological advancement in the lighting industry. LEDs are small, solid light bulbs that are extremely energy efficient and long lasting. Operating differently than traditional incandescent light bulbs, the benefits of using LED lights is matchless. This new form of lighting has an outstanding operational lifetime expectation of up to 100.000 hours. According to ledluxor.com, “This is 11 years of continuous operation, or 22 years of 50 percent operation. If you leave on the LED fixture for 8 hours per day, it will take around 20 years before you’d have to replace the bulb.” Different that standard lighting, LEDs are not quick to burn out, or stop working, if not at all. Instead, they emit lower output levels over long periods of time. When hauling, sometimes the job can be tough and wear down on your truck bed. Because of CM Truck Beds’ LED lighting, the wear and tear can be outlasted by whatever situations may occur. LEDs are exceptionally durable and built with sturdy components that are rugged and can withstand even the roughest conditions. Along with long-lasting life and durable quality, LED lighting also has zero UV emissions, light disbursement, and instant lighting and frequent switching features. As a nationally recognized leader in the industry, CM Truck Beds will continue to provide the very finest and innovative changes to our models. And ultimately provide you with nothing but the best from the very beginning of production, all the way down to our LED lighting. CM Truck Beds would like to once again remind you that extruded aluminum floors are now standard on all RD, SK, and PL aluminum models. This change is going to make our aluminum bodies even tougher than ever before. If you have not stocked this product, please take note and talk to your DSR about stocking this popular body.